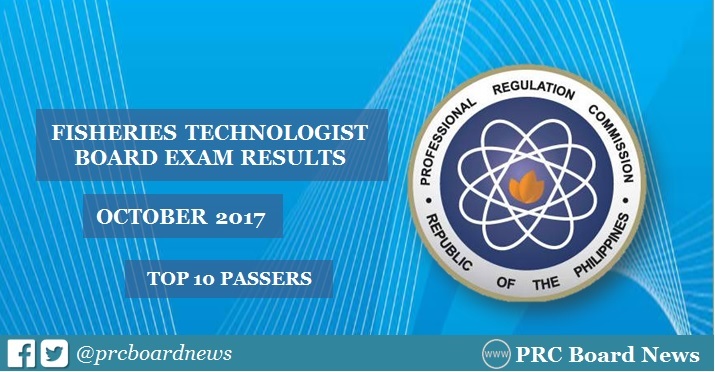 MANILA, Philippines - The October 2017 Fisheries Technologist board exam top 10 or topnotchers including other results - list of passers, top performing schools and performance of schools are released online on November 6, 2017 or in five (5) working days after the exam. The Professional Regulation Commission (PRC) administered the Fisheries Technologist licensure exam in the cities of Manila, Baguio, Cagayan de Oro, Cebu, Davao, Iloilo, Legaspi, Lucena, Tacloban, Tuguegarao and Zamboanga on October 25 and 26, 2017. In the same period last year, Vince Neil Bolasco Fuertes from University of the Philippines Visayas (UPV) - Iloilo City topped the board with 87.75%. It was followed by Mariel Capuno Benigno from Central Luzon State University (CLSU) and Dennis De Lima Tanay, also from UPV - Iloilo City, both having 87.50%. In the October 2015 board exam, Rosalie Napila Gomez from Mindanao State University (MSU) - Marawi City and CLSU's Adrian Deil Castro Manliclic tied on the top spot with 86.50%. UPV-Iloilo City graduate April Grace Rojo Opinion and UP-Diliman's Ezer Lunar Quizon ranked second with 86.00%. Here's overview of topnotchers for CPA board exam in the past years. I am a student of undergraduate and take admission for the standard profession. Now I will research the top level professionals in the technologies and come to which profession have scop nowadays. I recommend try this the students to check this website for getting more information. I have an interest in the Fisheries professions and find more knowledge about this. After wasting time, then I achieve the aim of life and take admission in this filde. Now I checked more students,s result who will succeed https://www.statementofpurposephd.com/writing-a-statement-of-purpose-for-phd-in-marketing/ creates a name in these technologies.